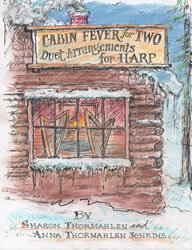 You're going to love this book and CD combination! 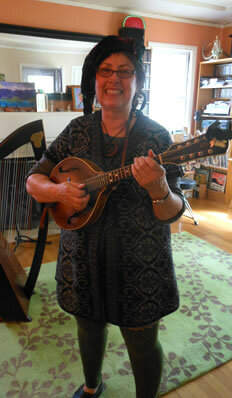 The music is infectious. When I take my dog for a walk and I'm listening to it on my Ipod, I find myself dancing down the street. I hope no ones watching! 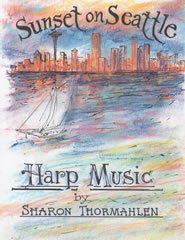 Make check out to Sharon Thormahlen and send to 1876 SW Brooklane, Corvallis, OR 97333 or you can use paypal. Please feel free to share this on your Facebook page. I'm not a Facebook person so I'm counting on you! "In ancient times, there was an endearing Kingdom called Kandilly, where many lived happily. On a hill a few miles away, there was the charming Kingdom of Kazooma. Sadly, the two Kingdoms were quarreling over the magical Singing Trees. 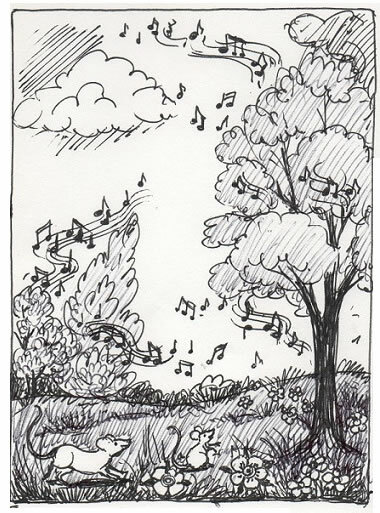 Both Kingdoms thought the trees belonged to them..."
This is the beginning of our Castle Dance story where you will meet the Singing Trees, Wizards, Jesters, Dragons, Princesses, Ponies, Castle Cats and more. 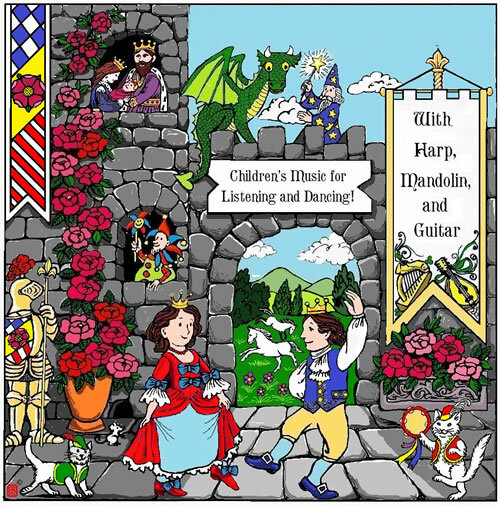 It comes with a CD featuring Harp, Mandolin and other instruments playing music that follow our Castle Dance story and encourages children to dance, pretend and make believe. 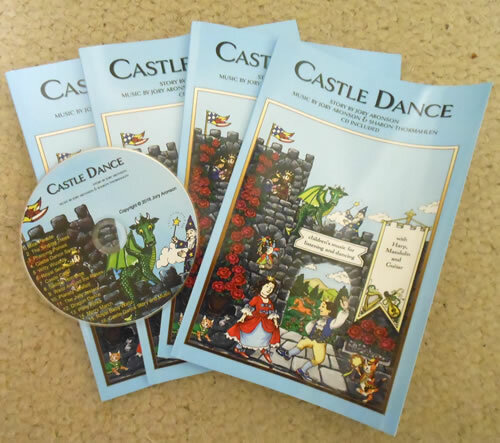 Martha Gallagher from the Folk Harp Journal did a review of Castle Dance Storybook and Music CD. 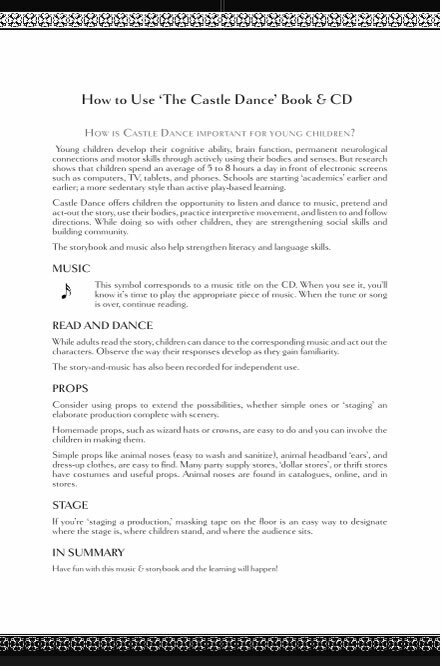 This is wonderfully useful for families, teachers of young children, grandparents and friends. 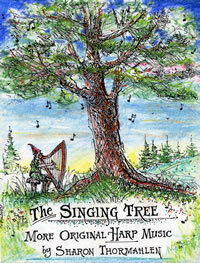 The story book, illustrated by Jan Reed, tells the story of 2 kingdoms fighting over the magical Singing Trees and how they resolve their differences through music and dance to ultimately share the magical trees. I hope nobody is watching! 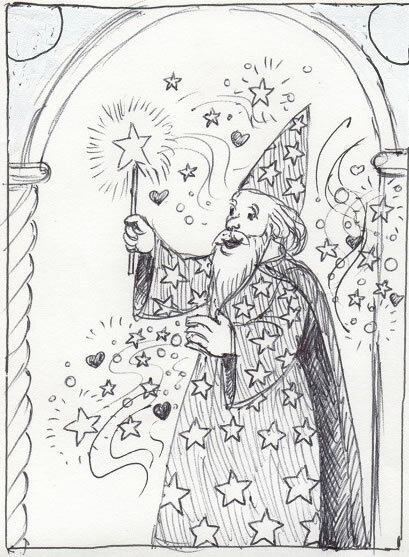 These are some of the preliminary drawings that you might find in the book. 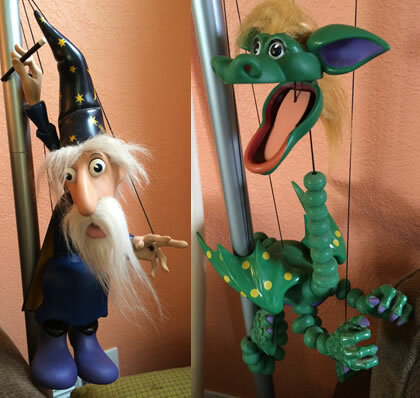 On the left are the Mice with The Singing Trees and on the right is one of the Witty Wizards. Jory's preschool of kids where we first tried out our idea. 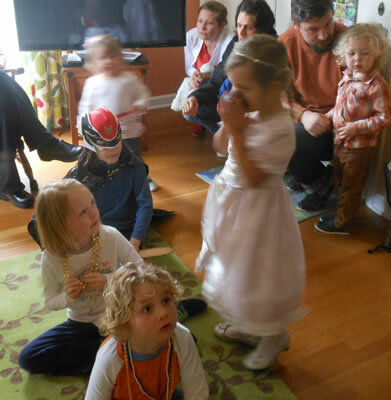 A Castle Dance Party complete with kids, parents and grandparents dancing and watching. 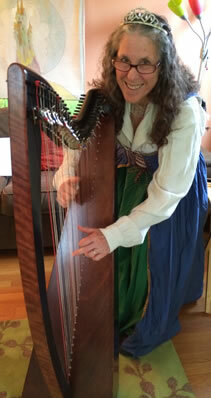 Sharon playing harp, Jory playing mandolin at the Castle Dance Party. 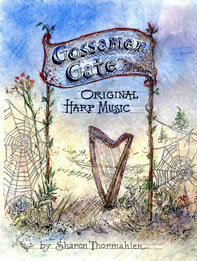 We are so lucky to have such wonderful musicians recording on this album with us. 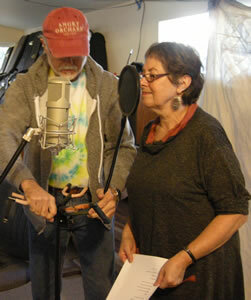 The Twins, Kriss and Kathy from Eugene, OR, added their vocals. 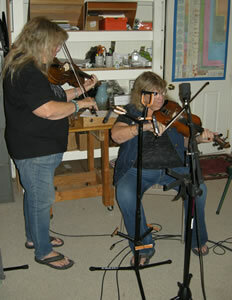 Kathy added violin and Kriss added viola on several cuts. It was sooo fun to watch them play. Here they are playing their part on the "Pony Polka." 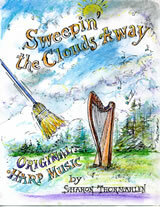 Also Joe Casproviak from The Mudtones out of Corvallis, added Clarinet and Flute. We could hardly sit still while listening to him play. Here he is adding his part on "The Wizards!" 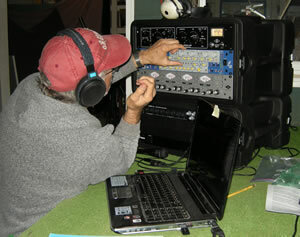 Paul Bezanson added some bass and keyboards to a few of the tracks and is our recording engineer. The patience this man has is just phenomenal! 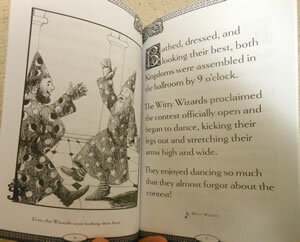 Sharon is recording the audio of the Castle Dance story and Jory is getting ready to record "Royal Baby Waltz." 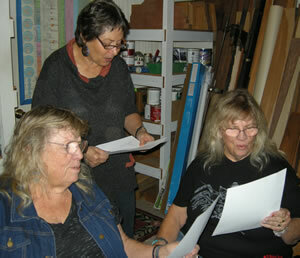 The Mighty Maidens working out their parts to "The Castle Dance" Proclamation. 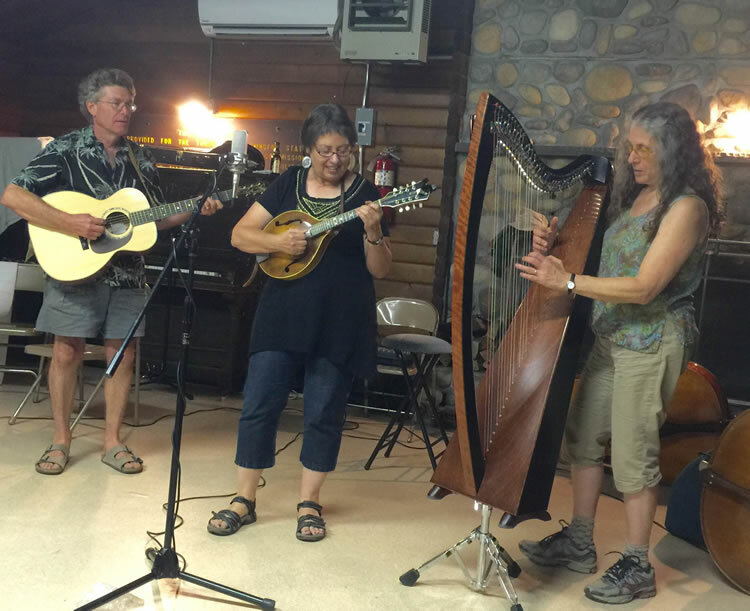 Wolf at the Big Odell renamed "The Mice Parade"
Waltz Around With Rosiee renamed "Waltz Around The Roses"
Dragon King renamed "The Dragon Dance"
Huckleberry Heaven renamed "Pony Polka"
Habanera Cats renamed "Castle Cats"
Sweet Serenade renamed "Royal Serenade"
This is Dave, Jory and I performing "Mice Parade" at a music camp. 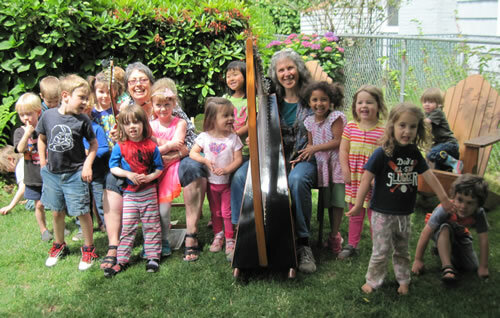 Make check out to Sharon Thormahlen and send to 1876 SW Brooklane, Corvallis, OR 97333 or you can use the email above for a Paypal payment.